For producing * Water For Injection * as per all approved standards. Triclover fittings for all pipelines. 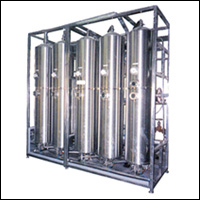 Pure Steam Generator is a single column unit producing pyrogen free sterile steam used for sterilization mainly in Autoclaves, Pipe lines, Fermentors etc. Optional Double Tube Sheet construction.